Here we go again… It seems Google has slipped yet another as-of-yet-announced device into its KitKat promotional materials. You’ll likely recall that the Nexus 5, which was released earlier this week, was accidentally included in a video promoting Android 4.4 earlier this year. Now Google has featured what appears to be an 8-inch Nexus tablet on the Android website. The image appears on the “apps and entertainment” page, which shows off some of the first- and third-party applications available for KitKat. The header image for the section about the Google Play media store shows a woman using a tablet that looks a little too big to be a Nexus 7, but too small to be the aging Nexus 10. The body design (specifically the bezel size) doesn’t match up with existing Nexus tablets either, so it’s pretty clear this is not one a tablet we’ve seen before. The tablet in the Google image does bear a striking resemblance to the 8.3-inch LG G Pad. A new tablet codenamed LG-V510—presumably the Nexus 8—was recently Bluetooth certified by the FCC, as reported by GSM Insider. 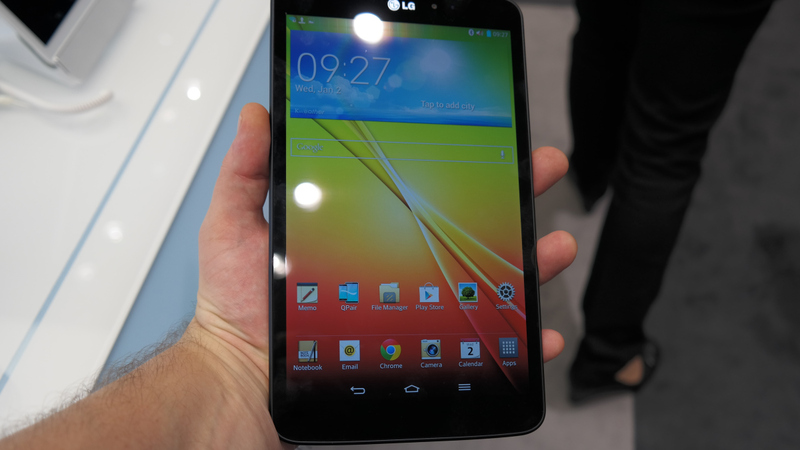 The G Pad’s codename is LG-500, so it’s possible that the Nexus 8 is an LG-manufactured cousin of the G Pad. There is some speculation that LG-V510 could also be an LTE version of the G Pad and not related to the Nexus family at all. Or the image on Google’s site could just be a really crappy Photoshop job.